The birthplace of the Olympics. Essai sur la Topographie d'Olympie dresse uniquement sur le rapport des Auteurs Anciens, Pour le Voyage du Jeune Anacharsis. 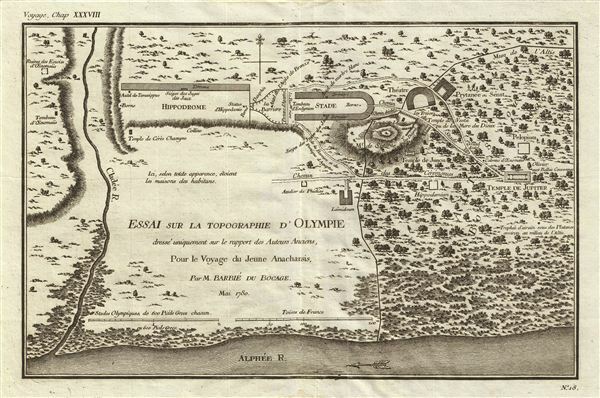 This is a fascinating 1780 map or plan of Olympia (Olympus) in Ancient Greece. The map details the site of the ancient Olympics and notes many important buildings and structures, including the stadium, the hippodrome, the Temple of Jupiter (Zeus). This is also the place where the great Statue of Zeus, one of the Seven Wonders of the Ancient World, was erected. The Alpheios River is seen near the bottom of the map. Prepared by M. Barbie de Bocage in 1780 to illustrate the Travels of Anacharsis.